FINANCE Minister Felix Mutati gives his speech during the official opening of the Batoka Gorge Hydroelectric Power, Investors Conference at David Livingstone Safari Lodge in Livingstone yesterday. Far left sited are Vice President Inonge Wina (l) and Zimbabwean Finance and Economic Development Patrick Chinamasa. 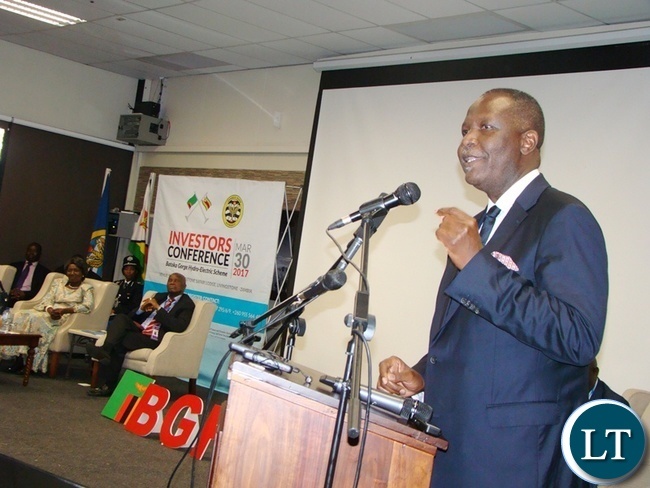 The investor conference on development of the Batoka Gorge Hydro Electric Project recently co-hosted by Zambia and Zimbabwe was over-subscribed in terms of attendance and interest, Finance Minister Felix Mutati has said. During the conference, the Governments of Zambia and Zimbabwe, through the Zambia River Authority Council of Ministers, undertook to facilitate partnerships for the 2400 MW Batoka Hydro Electric Power Project; given the elevated power demand in the two countries and the whole SADC region. Zambia’s power demand is forecast to grow from the assessed 1,911MW in 2015 to a projected 5,508MW by 2035. Over the same period, demand in Zimbabwe may increase from 2,116MW to 5,301MW, respectively. The Batoka Investor Conference generated significant interest from both financiers and investors who expressed strong commitment to participate once the project procurement documents were finalized. The two Governments committed to a transparent bidding process which would ensure a competitive process and value for money. With regard to the environmental impact assessment for the project, an assurance was made to investors and local delegates that the project is designed in a manner that minimizes environmental impact and degradation. “Due to sparse human habitation around the gorge area, the project will not have any adverse impact on the social and economic welfare of the people on either side of the Zambezi River,” assured Mr. Mutati when asked about the plight of the current inhabitants in the precinct of the gorge. The conference, which was recently held in Livingstone Zambia, was graced by the Zambian Vice President Mrs. Inonge Wina. Over 300 participants from key multilateral development banks; development finance institutions; commercial banks; investors and contractors from across Africa, the Americas, Asia, and Europe attended. The conference was hosted by the Zambezi River Authority Council of Ministers comprising Ministers responsible for Finance, Energy, and Water in both Zambia and Zimbabwe. The aim of the conference was to market the potential for the Batoka Dam Wall and for the combined output of 2,400 Megawatts from Hydro Power Stations on both sides of the boarder, located 54 Kilometers downstream from the Victoria Falls. The conference also accorded Zambia an opportunity to reassure the international community that the country remains a welcoming and one of the best destinations for investment in Africa. “The Batoka Hydro Electric Power Project is a flagship undertaking for job creation and infrastructure development which is why, our part as Zambians, there is need for concerted collaboration among all responsible Ministries to ensure success of resource mobilization and timely construction of the dam and the Hydro Power Station,” concluded Mr. Mutati when asked to give an overview of the conference. Felix Mutati in Brussels for the 2017 World Customs Organisation Global Transit Conference. Last time he was in Europe he said he was overwhelmed by the number of investors he met, today he is complaining that the conference in Livingston was over subscribed, i don’t understand this man, does he believe in himself, he seems to get overwhelmed so easily. Yaa some headlines!? Is Mutati complaining of attendance, and because on of financiers disclosed Zimbabwe owe Zambia money, of which Mutati was not aware? Like all of you, I have been wrong in Mutati he has proved insightful, content. Forthright, erudite and insightful. He calm and collected and breathes excellence and makes a sapient approach in his excution of his duties. His kind is what we need and I confess with my hands up, I prematurely judged him. A 100 year old colonial left over is holding Zimbabwe hostage. I blame the Zimbabweans, Mugabe is not the Crazy one. THE OVERALL ARTICLE DOES NOT SAY MUTATI IS COMPLAINING. TO THE CONTRARY, THE ARTICLE APPEARS TO BE SAYING HE WAS HAPPY ABOUT THE TURNOUT. READERS MUST BE WARY ABOUT LT’s COPY-AND-PASTE JOURNALISM. EVEN IF THEIR ‘FRIEND’ WAS JUST MAKING A DRAFT, LT WILL JUST COPY AND PASTE THE WHOLE THING INTO THEIR LATEST NEWS BULLETIN WITHOUT EVEN EDITING WHAT THEY HAVE COPIED. Who does Mutati represent? MMD or PF. This whole Mutati thing is a Charade and the biggest scandal in the history of Zambian politics. The Zambian purse being in the hands of the oppocsition while the key ruling party members are sidelined. Mushota you are incoherent and a stupe. Someone likened me to you and I am not having it! I am far much more structured in this crazy scheme of things where Lungu, is a forged President, to use your words. Now you are championing Edwards Lungu’s agenda on LT, crazy. Mutati is a phoney and a fake representing a wrong camp in Micheal Sata’s PF. Lungu is a traitor and a rigger. One thing is that he will not get away with it. I have had a good weekend and I will not let anyone ruin my anticipated good week ahead. I will just let all of you destroy the great country, Zambia. And you wonder why they are interested …Mutati is one sick puppet ..you would think the will be no or minimum return for the so called investors. Iwe so-called ANALYSER, in Zambia only government has Ministerial and not political parties. So, Mutati is ZAMBIA’s Finance Minister. Therefore he represents and stands for ALL Zambians when he does anything as Finance Minister. You have not cared to read my question to give me an answer. Go to sleep. Lungu has been largely quiet responding to his opponent’s rants only when it is absolute necessary. They have labelled him vision less and yet they (UPND) spend sleepless nights thinking of the next joke move to make, to the point of appearing stupid. Armageddon that Armageddon this even before the elections and this has continued unabated. Now we know that they referred to the thugs they recruited to cause mayhem during and after the 2016 general elections and those thugs, Recently arrested will rot in jail while their masters are busy milling maize meal and tending to their cows. One would understand the gravity of losing elections five times but it is not a passport to set the country ablaze. You can still wait for 2021, what is the hurry about.? In the wake of various stings and a barrage of opposition he (Lungu) is stealthily encouraging his ministers to work. Those who have never been to Zambia will not understand this, but let me tell you there is something happening you may or may not like it but it is happening for those with eyes to see. Of course those who choose to put a black cloth on their face will not see anything and that is the beauty of democracy. But when it matters most, 2021 will come and then the real employers (Electorate) will put their signature on that piece of paper called ballot paper. Ba Mutati kuwayawaya fye! Ba Minister simple economics as things stand in Zambia one bag of mealie can buy two bags of cement. Therefore if Zambians stop eating they can build every month. Now if mealie meal a basic food is now costing K100 and above, how is the Government addressing the basic needs of majority Zambians who cannot afford a meal a day. Ba Mutati should stop operating like a Minister of Commerce whose responsible for attracting investment and operate like a Finance Minister responsible for mobilising resources for economic development. The Batoka project can be easily structured by technocrats other than the Minister always jumping where he thinks he will get a cut. Mutati is all talk and no action just watch the space and see . Zambia is burning with pf police assaulting and killing opponents and this f00l is talking about an irrelevant meeting he attended. Pathetic mb0l0s. Lungu is dying soon. I can smell death. After borrowing TEN BILLION DOLLARS these thieves are now begging for financiers to come and bail them out! Get real. Nobody is interested in investing this kind of money in a country that has an illegal usurper that stole an election and has refused to let the courts hear a petition. These “investors” came to listen. Will they INVEST? What will they do when Lungu and his thugs decide to nationalise their investments? Go to Zambias KANGAROO COURTS that helped Lungu steal State house? Dream on Mutati. Lie to the Nation. It will only happen when Zambians get a truly independent Judicary and has a record of upholding the Law. The foreign investors were invited to the Investment Conference. How was meeting oversubscribed when there were no pledges were invited and made. Mutati is trying to lie to us. Both Zimbabwe and Zambia are illiquid at the moment and are therefore unbankable at the moment. With No Respect of Rule of Law ,Constitutionalism, Human Rights and Good Governance in both countries it will be difficult to raise $4 billion. Both Zambabwe and Zambia are financially bankrupt anyway! Are you normal Jonathan, still posting things even you don’t understand? You expect us to google what SPV, PPAS is? Your wife should be a very bored woman listening to you everyday. PF police have killed an innocent citizen in kanyama and PF lusaka times would rather put this ugly man as headline. Indeed zambia yaslila. Zambia is headed the zimbabwe way and it is very sad to watch. Zimbabwe has a larger population then Zambia and is potentially much much richer and after mugabe there is forecast rapid growth..much more then Zambia which is expected to struggle paying back the 10 billion US. The population difference between Zambia and Zimbabwe is small, and Zambia has more potential for growth than Zimbabwe. How has Zambia more potential for growth ? Have new minerals been discovered ? This spout of growth been seen is due to the 10 billion US borrowed. Soon Zambia will be paying back that money. Investors are few and far between even with the roads built. @1, do you really understand English? The term oversubscribed is the same as overwhelming. You went to vernacular school and now you want to embarrass yourself, what is wrong with UPNDonkeys kanshi? The bally why so confrontational?? @18 spake like lilo, the figures quoted are provided by Zimbabwe in the information memorandum, who are you to write what Zimbabwe did not tell you? Thats the problem with PF kaponyas, no analytical thinking. If it’s not stealing on their minds it’s borrowing. Who told you that info was provided by the Zimbabweans? How can a country with a much larger population and much richer than Zambia consume less electricity ?? The conference was overwhelmed by PF idlers and Zanu PF busybodies.Serious investors are going to serious countries like Rwanda ,Kenya and South Africa not this kantemba Mutati led conference. Terrible terrible terrible what grasp of the english language do you have. Think before you post. When you have 10 places at a venue and 11 peole apply then you are oversubscribed. He thought the investores were offering free money in the kaponya pockets….. I guess Mutati is the keeper of the gate…taking attendance lists so that he can announce how many organizations attended any meeting be has been invited to be the keeper of the entrance gate! He has no solution on how Zambia will raise money to payback the Eurobonds! He is busy taxing Zambians left, right and centre. Soon we shall have toll gates leading into some houses in Lusaka as this clue less time waster struggles with issues beyond his abilities. At least he is able to walk along Katondo Street to hustle with his PF thugs!